The Church of San Spiridione of the Serbian Orthodox Christian community stands above the filled-in portion of the canal, now Sant'Antonio Square. 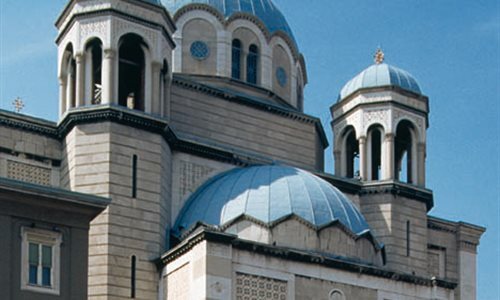 The white stone building with red marble columns has a Greek cross floor plan beneath a large dome supported by four large arches and flanked by four hemispherical domes above the four arms of the cross. The structure is reminiscent of Byzantine-style Eastern churches. The church, which opened for services on 2 September 1868, can hold 1,600 worshippers. The interior is decorated with exquisite frescos and oil paintings. The four prized icons in the iconostasis are of great artistic value. Covered in gold and silver, they were produced in Russia in the early nineteenth century. A striking, large silver candelabrum stands in front of the iconostasis. It was donated by the Russian Grand Duke Paul Petrovich Romanov during his visit to Trieste in 1772. Interesting fact: The white stone comes from the Santa Croce quarries and the Brijuni Islands in Istria, while the red columns are made of Verona marble.